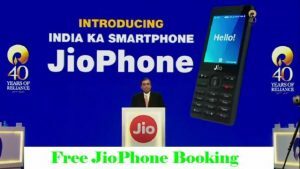 Reliance Industries Chairman Mukesh Ambani announced the Jiophone beta tests to start on 15th August and the Jio 4G feature phone booking ahead of the scheduled 24th August. As promised the company has started beta testing by giving the Jiophone to select users by Jio employees are using the device and they will report any software and hardware glitches. So, before the reliance company has resolved the issue, then the Jiophone reaches to the users to use in September 1st week. Jio Phone bookings online, user can check the MyJio app on August 24. User can sign up for updates on the Jio.com official website, clicking on Keep Me Posted, and filling the required details. Individuals can only book one Jio Phone unit against their Aadhaar number and if you want to book more than one Jio Phone, you can place the pre-order in business categories then you will have to give your organisation’s PAN or GSTN number. Once you register your details, you will receive the details around Jio Phone launch on your mobile phone via SMS, and on email. But the Jio Phone bookings have opened in certain offline retail stores and user will need to submit a copy of your Aadhaar card with the authorised Jio retailer.